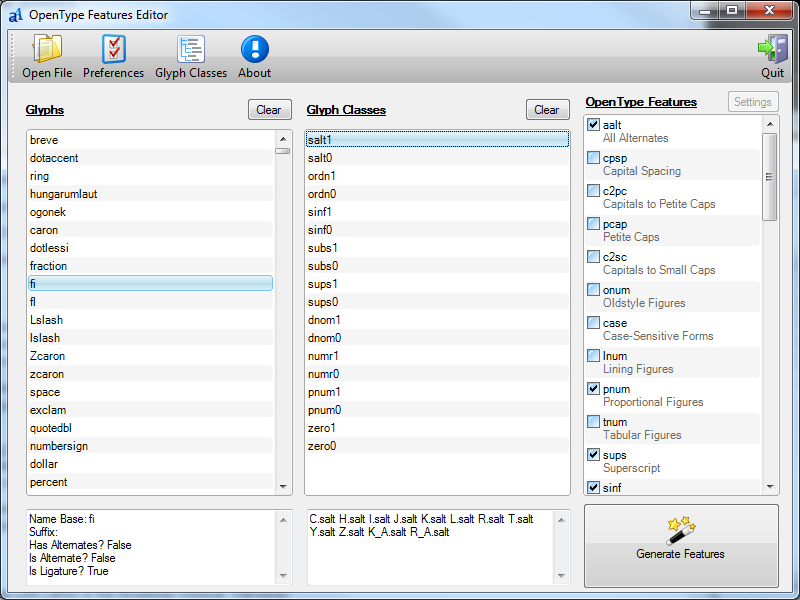 OpenType Features Editor is a Windows utility for font developers who want to reduce some of the tedium of adding OpenType features like ligatures and stylistic alternates to their fonts. It opens standard Adobe font metrics (.afm) files and automatically generates OpenType features based on configurable glyph name mapping that can then be saved as a features (.fea) file. That means OTFE will work in any font development workflow that can handle exporting an Adobe font metrics file and importing an OpenType features file. Have feedback? Please feel free to email me (tim -at- timrolands.com) with any questions or suggestions. Thanks! Add support for ligature mapping based on suffixes. Re-facture/optimize loading of glyphs and generation of classes and features. Fix for flexible glyph mapping. Add flexibility to glyph name mapping for features. Fix ordering of ligatures so ligatures with more components are added to rule before those with fewer. Fix repetition of feature rules in features. Fix behavior of clear buttons. Fix issue with clearing of lists. Support setting of standard ligatures list in preferences. Fix autogeneration of ligatures for glyphs/ligatures with suffixes. Additional default standard ligatures to support |fi| forms as well as |f_i| forms.